Instead of taking sides when children fight, treat them the same. 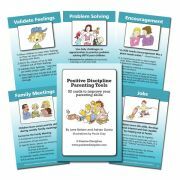 3) Leave - Fighting will diminish significantly when you stop getting involved-so long as you are having regular family meetings to teach problem-solving skills. This tool card is going to be very difficult for me. I've had discussions with my mom on this topic and we finally just agreed to disagree. Of course I am coming from the perspective of a younger child with an older brother who was pure evil! We are talking about a kid who once hit my older sister with a baseball bat because she wanted to watch a different television show. On the bright side, my older brother did help me improve my athletic ability because I was always trying to outrun him. 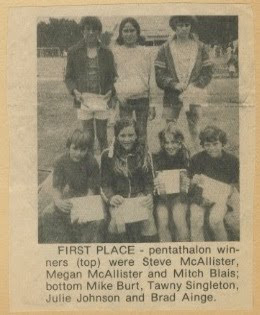 In fact, when I was 10 years old I won the local Junior Olympics Pentathalon. This story does have a happy ending. My brother grew up to be a good, law-abiding member of society and I managed to survive not much worse for the wear. But I think it is still in the back of my mind when I'm dealing with my kids. I'm always assuming that the older brother is the instigator. We had an experience this past week when we were helping somebody move and I brought my kids along to help load boxes in the car. We were almost finished and I had one more box to carry into the house. I asked my kids to get in the car and told them I would be right back. I wasn't gone more than 30 seconds when I heard a blood curdling scream from my daughter. I rushed back to the car and Emma was holding her eye and Gibson was standing there with a very guilty look on his face. I completely lost it! I started yelling at Gibson asking him why he can't stop bugging his sister for 30 seconds. I told him he needed a new hobby besides bugging his sister. I'm sure I said other things that I can't remember right now. Meanwhile Gibson was cowering in the passenger seat taking all the abuse without responding. Does that sound like I put the kids in the same boat? Obviously not. I still don't know exactly what happened. All I knew was that Gibson poked Emma in the eye, so I bypassed the miranda rights and went straight to the punishment. I spoke to a friend of mine about this incident and she said that sometimes older siblings feel like the younger sibling is favored by the parents. So they will act out to get attention and put down the younger sibling to feel better about their place in the family. It occurred to me that perhaps I could prevent much of these problems by helping Gibson feel more belonging. Maybe doing more things with just the two of us and taking more interest in his world. That's kind of a long-winded way of saying that I will try and implement this tool card during the coming week. Regardless of how difficult it will be, I am going to put the kids in the same boat. We don't allow fighting, so I won't be sending the kids outside to fight. But I will have them come up with a solution and I will treat them both the same. As an added element, I am going to spend more time with Gibson. Maybe after Emma has gone to sleep we can spend a little time talking about his day. And maybe we can plan one activity this week that is just for the two of us. Oh boy, this will be a challenging card for us too. Brad, I also meant to say that I could have interchanged your kids' names with my kids' names in that situation you described. I know that feeling that you have when you've gotten really upset and wished you had handled it differently. Your plan for this week sounds like a good one and I'm looking forward to hearing how it works out. 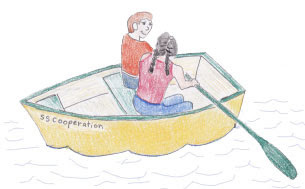 Sibling fighting is the biggest, most consistent problem that we have...on the plus side, it will give us lots of opportunities to practice putting them in the same boat this week! Brad, I told you I wanted to start corresponding to your blog in my blog. This seemed like a good one to start with. I can see this card may need to be revised to focusing on solutions since it is so difficult to explain all the intricacies of why it is important to treat children the same. I gave it a shot. Your story reminds me of something amusing I heard recently about parenting. One mom put her accomplishments into perspective by saying, "It was a crumpled kind of success". It's like when you re-do a math problem so many times that the paper is smudged and crinkled, but you finally get the right answer so you don't care-you're just happy you finally got it right! Luckily, in parenting, we don't have to do it right the first time, as long as we keep trying! So let's celebrate any success...even if it happens to be crumpled! As a mom of just one kid I kinda ingnored this card for the week thinking it didn't apply to my world....but then discovered a work situation for which this was unbelievably applicable. By thinking about your card I was able to identify a situation where many of the divisions in our corporation had gotten used to "dad" getting called into problems that ran across them and coming up with the solution that was going to be best for everyone, let's call it the family perspective...and that now that "dad"'s not in a position to intervene, we really need to make sure these divisional siblings have the tools to figure out their own issues with each other in a way that benefits all the parties involved. And you're right, just letting them ignore each other isn't good enough, as it results in too many great opportunities for solutions that are better than what they could do alone end up left off the table that way. To do this right requires all the siblings shifting their approach to really feeling like they can and should explore alternatives with each other that they can all find value in.